I can't believe Christmas has been and gone, it went in a flash this year! I always love doing these posts so I knew I wanted to do one again this year. They are lovely to look back on each year and if you have done one too please send me a link on Twitter so I can have a read and comment. I hope everyone had a lovely day yesterday, I know I did. One of the first things I opened this year was the Too Faced Matte Chocolate Chip Palette. I have been wanting to get my hands on this ever since it launched last year so when I finally spotted it on the Debenhams website it went at the top of my Christmas list! I love my original Chocolate Bar Palette so I knew I wanted to get this one too. Another makeup item that I had been really wanting and was excited to unwrap was the Soap & Glory One Heck of a Blot Powder. I love the primer and the foundation from this line so I can't wait to see how this works for me! Essie nail polishes are one of my favourite formulations and I had really wanted the Essie Advent Calendar but it was completely out of my budget at £80 but it did go down to £10 which is an incredible deal so my mum said she had to get it for me! I can't believe how many products (and full sizes) are in this. I love Real Techniques Brushes and both myself and my younger sister unwrapped the Ready Set Glow Set which comes with all the highlighting brushes I could ever need! My best friend Chelsea spoilt me this year and got me the Pandora Bunny Charm. I had been wanting this for ages and I hadn't even mentioned it to her so I was so excited when I opened it! She got me a few little things too which I love but one of my favourite presents I got this year was my John Cena Pillow, I must have mentioned it to her at some point but I am honestly obsessed with it! If you didn't already know, love him far too much and it is one of the softest and most comfortable things that I now own! My lovely friend Lily (from Pint Sized Beauty) sent me a lovely Christmas care package with some lovely bits and pieces from face masks to socks. One of my favourite things she gifted me was a mug with everything I need to make a hot chocolate in! My friend Kiran sent me and my bunnies some lovely presents this year, I have felt so spoilt this year! 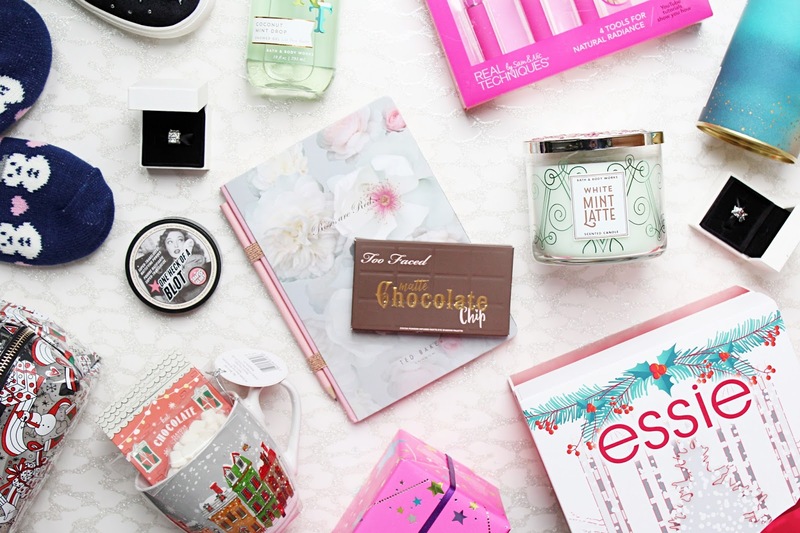 I got a gorgeous Bunny Ear Ring and a Skinnydip x Starbucks Christmas Makeup Bag and a couple of other things! I love Skinnydip makeup bags but my sister actually stole my other one so I was so happy to receive a new one. One of my favourite people that I know got me a Gilly Hicks Sweatshirt and if I was a jumper it would be this! It's in my favourite colour and style, I can't wait to wear it. Besides John Cena and makeup, the only other thing I am truly obsessed with is candles, I can't get enough of them! Bath and Body Works candles are my absolute favourite and my mum got me the White Mint Latte 3 Wick which smells incredible! I also got some Bath and Body Works shower gels and bath bombs that I can't wait to use, the shower gels are some of my favourite ones. I really love Yankee Candle and the Peppermint Martini Candle is actually really hard to get ahold of in the UK but it was on a local outlet store near us and as I am obsessed with all things peppermint she knew I would love it! My mum really spoilt me this year and got me some really lovely other bits like a Ted Baker Notebook which she said would be perfect to keep my blog organised, I thought was really sweet of her to think of things like this for me. She also got me a few more charms for my Christmas themed Pandora bracelet and so did a family friend, they got me a gorgeous silver present! One of my favourite brands to work with Soap and Glory and I have been super lucky to work with them a lot in 2017. 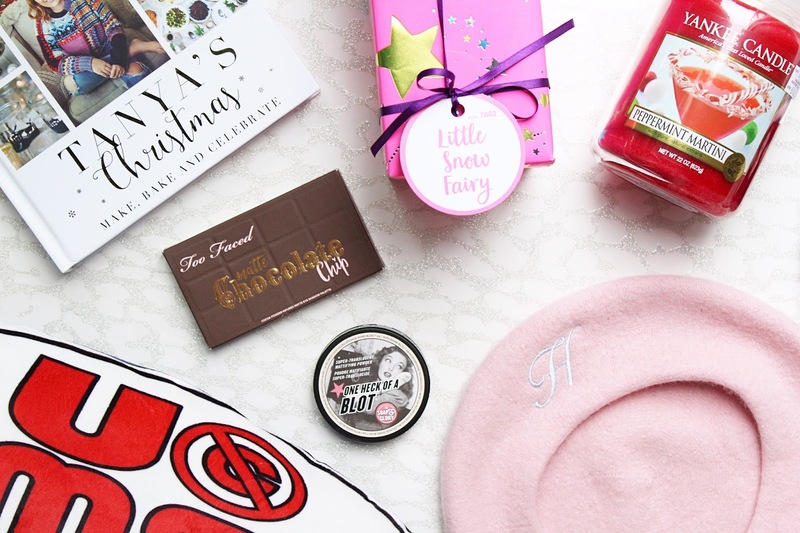 I always get so excited by their products and I am often buying them and they were so lovely and sent me a Personalised Pink Beret. This honestly just screams Soap and Glory vibes and it's so cute!